Advantages: Packed with attractive profiles; many and varied colours and markings across all Mirage F1 operators; logically organised; includes scale drawings; operational and walkaround photos; detailed and useful captions describing ops, colours, markings and unusual features; specific references cited; great source of inspiration for modellers. 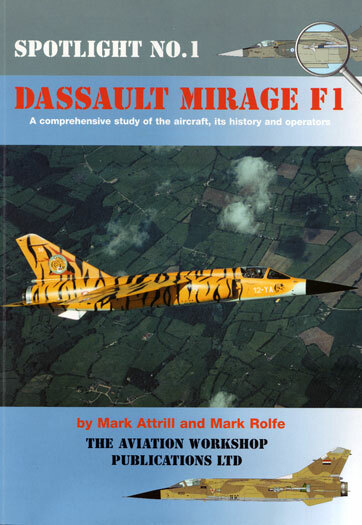 The Aviation Workshop has released the first in their "Spotlight" series, Dassault Mirage F1. This is a larger book than the earlier "On-Target" titles from the same publisher, and the format is also new. This title also includes many reference photos. In the first 59 pages, these are full-colour photos of the Mirage F1 in action and at rest. The last twenty pages of the book includes detailed walkaround photos of South African, Spanish and French Mirages. Captions accompanying the profiles are excellent, describing colours, markings and operations. This is especially useful to modellers, as the artwork will provide the inspiration; but a photo will identify a myriad of minutiae. Also very welcome is six pages of detailed plans, including not only the main Mirage F1 variants in 1/72 scale, but also weapons and other ordnance. This first book in The Aviation Workshop's "Spotlight" series is a terrific one-stop summary of the operators, colours and markings of the Mirage F1, and will be especially useful for modellers with its detail photos, inspiring artwork and scale plans. It will be interesting to see what else is covered in this series. Thanks to Model Alliance for the review sample.